On our first full day in Orlando Traivor and I woke up early to make sure we had time to hit every ride at Universal's Islands of Adventure. While Traivor is not a Harry Potter fan, I am an enormous fan, having read all of the books and seen all of the movies. I was so excited to check out Hogsmeade and experience the rides within The Wizarding World of Harry Potter that I could barely contain myself. We arrived promptly to the Islands of Adventure at 8am with our tickets and FastPasses in hand. We both had friends who had visited before and had miserable experiences with long queues in the Harry Potter section of the park so we knew to head there first thing. Even though we arrived at 8am, there was already a substantial line to enter Ollivander's Wand Shop so we ditched that and went right to Harry Potter and the Forbidden Journey, which was an amazing ride. After enjoying butterbeers in Harry Potter land we headed to the other Islands, making stops in every single one. By noon we were pretty exhausted, having made an entire round of the Islands, and headed to Mythos for lunch. Traivor picked it out after extensively reading TripAdvisor and seeing that it was ranked the best amusement park restaurant in the world. I was happy to see that the menu marked its items with "Gluten Free" if the dish could accommodate a gluten free eater. The restaurant was a sit-down, full service affair, appropriately called "Fine Dining" on its official site, unlike many of the other cafeterias we saw dotted around the park. It was a great option for us, having been up since a little before 7am and done all the rides; we needed a respite from the park for a few minutes before soldiering on in the afternoon. 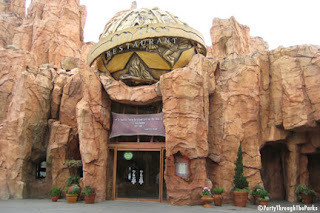 Unfortunately I can't find a link to the menu at Mythos and it has been weeks since I visited - I knew I should have done this post sooner! Regardless I remember enjoying my experience. If you do decide to head to Mythos during your Islands of Adventure visit, I would definitely make a reservation; the line was already extensive when we went around noon and was even longer by the time we left.